Hello, I’m looking for a tool that will allow me take an XSD and create POJO classes, not xmlbeans. Is it possible to use Visual Paradigm for this? XSD -> UML and then UML -> Java? You can use Instant Reverse to reverse XSD to Class. 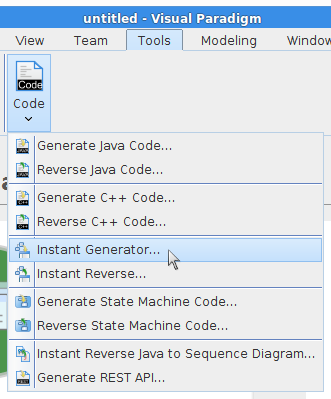 Then use Instant Generator to generate Java from Class. Thank you for using Visual Paradigm. Thanks @ roykeung. I’m finally getting a chance to try this, but as I’m brand new to VP, so I’m a little confused. 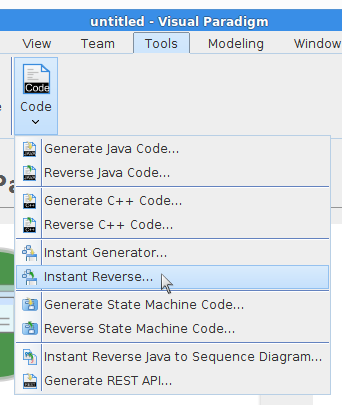 When I choose Tools -> Instant Reverse - I don’t see an option for adding an xsd, which is my starting point. And, am I reversing to a Class Diagram, before invoking the Instant Generator? OK - never mind the last question, I figured out how to use Instant Reverse with an xsd. But I’m getting an Unknown error. Are there any logs to check that might give more specifics?